Nelly and Sherihan is an Egyptian comedy show that aired during the summer of 2016, with about 30 episodes. 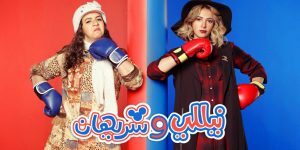 The show is a Ramadan “Mosalsal,” which means that it aired a new episode each day for the entire month of Ramadan, then concluded at the end of the month. Nelly and Sherihan is an interesting sitcom because it utilizes comedy in a way to not only evoke laughter, but to further messages about Egyptian society and culture. The show does not do this through explicit messages or plain-spoken social commentary, but rather, it utilizes the storyline and characters to present implicit messages about Egyptian society. The show revolves around the lives of two women: Nelly and Sherihan. The two live vastly different lives, with Nelly coming from a very affluent family, and Sherihan living a very ordinary miniscule life. The pilot episode depicts different scenes following each woman’s daily life, and juxtaposes the two by showing Nelly’s lavish lifestyle, immediately followed by Sherihan’s run-of-the-mill life revolved around work. The contrast between the two is made abundantly clear in the first episode, in order to build up the audience for the ground-breaking news that the two are actually cousins. Their first interaction is in the pilot episode, in which Nelly hits Sherihan with her car. They then found out that they were cousins, and from there, the two can no longer get away from one another, being forced into new coerced interactions with each episode. The show is conventionally funny, and utilizes a very typical form of Egyptian humor to evoke laughter, through the use of both dry and straight-forward humor. This is not the only thing that the sitcom brings to the table, however. As aforementioned, the series does an excellent job of juxtaposing the lives of Nelly and Sherihan. This juxtaposition can be looked at in a much broader lens, however, when considering the different livelihoods of Egyptians from different social classes. What the show does, essentially, is bring forth implicit messages of the contrast between those born into wealth, and those forced to endure the struggles of the working class. In the series, Sherihan works three menial jobs, while Nelly spends her time hanging out with friends and scheming to sabotage a girl she has a feud with. This goes to further showcase the significant lifestyle differences between wealthy and non-wealthy Egyptians, and the inequity present within Egypt’s borders. Because the two are cousins, who are the same age, with similar physical features (it is the same actress in real life that plays either character), it essentially goes to show that in Egypt, it is mere birthed privilege that can make the difference between rich or poor, “high-class” or “lower-class,” and “classy” or ordinary. Ultimately, the series touches on real-life social issues, but through the use of comedy and story-lines to further messages on the current state of inequity and classism in Egypt. The show never explicitly makes statements regarding these issues, however, through the use of juxtaposition and humor surrounding the subjects, it is safe to infer that one of the messages to gain from the series is related to the unequal distribution of wealth in Egypt, and the ramifications of such inequity. Overall, Nelly and Sherihan is a very comical series, that can push one towards asking thought-provoking questions, without ever explicitly addressing those questions in the show.